These roof sheets are strong and have a long life span. Different thickness sheet is available for different jobs. 10mm is suitable for greenhouse roofs car ports lean to canopies etc. 16mm is better suited to out buildings storage areas larger canopies. 25mm is suited to consrvatory roofs. The possible uses are endless from Airport roofs to School canopies polcarbonate is a very versitile product. 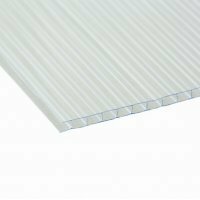 Polycarbonate sheet nomally take 3 working days to deliver. Larger order are delivered via our own transport.